Although the bathroom of every home or apartment can often be overlooked, there are awesome ways to create a beautiful, unforgettable bathroom. Bath time may become the highlight of your day with the right qualities and features for your bathroom. 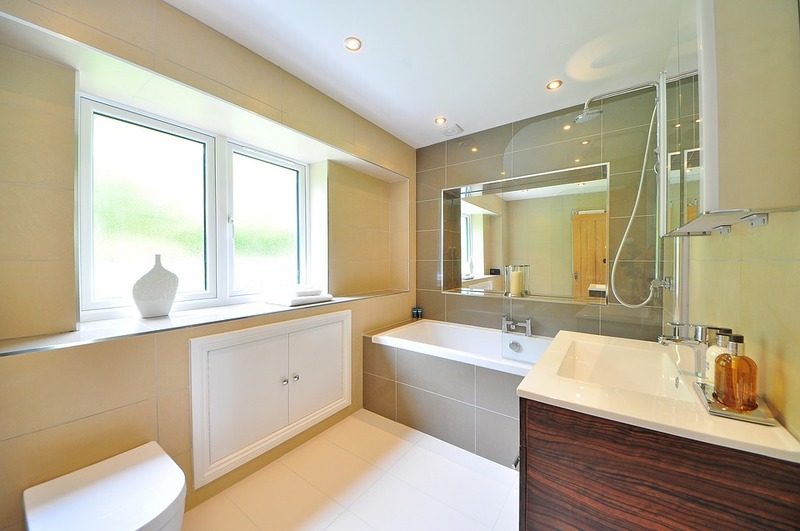 Read on for some tips and ideas to make your bathroom one of your favorite places to be. A vanity is a beneficial and simple way to improve any bathroom. Even better is a double vanity with two sinks. It’s especially useful for couples or families who may want or need to use two sinks at the same time. There are so many ways you can choose to customize a vanity to fit your needs. Adding drawers or cabinets allows for extra storage, and you can choose from many different materials and colors. A marble pattern will create a luxurious and modern feeling. Marble counters, walls and and more add a sophisticated touch to any bathroom. If you’re considering a redo for your bathroom, trying marble may be a great choice. No matter what exactly you choose, a vanity is undoubtedly a great way to make your bathroom convenient and more comfortable. One design trend that’s never going out of style is ceramic tile bathroom flooring. Not only are they waterproof and durable, it’s an affordable way to upgrade any bathroom floor. You can find almost any color or pattern of tile to use for a bathroom floor, and there’s something to fit almost any budget. The biggest negative to having ceramic tiled floors is the cold that comes with it. Because they lack warmth, you can add electric mats for underneath the tile. Because the mats are radiant heat, they’re very efficient and take minimal time to create warmth. Walk in showers without curbs are becoming more and more popular, and it’s easy to understand why. They’re extremely safe, stylish, and very simple to clean. Without a curb to step over, getting into your shower will be easier than ever. And there’s much less risk of accidents, as it is typically very common to slip or trip while entering a shower. These type of showers typically are framed with glass, which also makes it more stylish. A simple walk-in shower with glass doors feels effortlessly sophisticated. Curbless showers can be tricky to build, and the shower floor needs to have enough of a slope for the water to reach the hole of the drain underneath. That’s why it’s so important to hire a reliable contractor with plenty of experience. One great option for all your bathroom design and remodeling needs is uniquedesign.net.au. Not only will a motion-activated faucet feel more efficient and modern, but it’ll also save you money. Because these type of faucets turn off automatically, you won’t be running water when it’s not needed. Brushing your teeth can generate a lot of water if it is running continuously, but a motion activated faucet can prevent this problem. You may think that the bathroom isn’t somewhere you’d want to sit, but when you have a cool bathroom you may find yourself wanting to spend a little extra time in there. Including some seating is not only useful, but it’ll also make your bathroom feel more luxurious and comfortable. A small bench next to a vanity or near a storage cabinet could be a great addition to your bathroom. It may be surprising, but featuring a small fireplace in your bathroom may make your bathroom feel cozier than ever. Although you may not typically expect to see one in a bathroom, it’ll be perfect for watching while you’re taking a long relaxing bath. You could also install a TV if you’re not a fan of fireplaces – or include both! Featuring a television or fireplace in your bathroom is an easy and simple way to make your time in the bathroom more relaxing. There are so many different ways to create the shower of your dreams. Of course, a walk-in shower is one option, but there’s so many more choices. You can opt to have dual showerheads or handheld ones. There’s also many different types of showerheads. One popular choice is a rain showerhead, which has the appearance of rain falling as you shower. No matter which you choose, there are so many ways to make it perfect for your needs and preferences. You can also customize the layout of your shower. Adding seating inside your shower is one way to make it easier to use and more comfortable. All it takes is just a small ledge to sit on, and it’s perfect for those who like to be able to sit while they shower. These are only a few of many different ways that you can turn any bathroom from ordinary to exceptional. With tons of options including vanities, bathtubs, shower, flooring, and more, there are so many choices that can make your bathroom amazing. Bath time may become much more exciting when you follow these suggestions.